To the left of names of persons in lists or reports, you will see the Reports icon. When you hover over this icon with your mouse, a popup will be displayed. 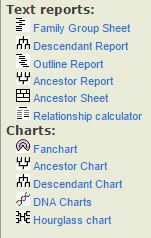 In the popup list you will find several icons with names of reports and charts that you can create from this person (the exact number of icons on the list varies according to the presence of ancestors and/or descendants). Following is a list of those icons and their meaning. Ancestor Report (Pedigree): A pedigree is a genealogical report of a person's ancestors. A pedigree uses a special method of numbering: the base person is number 1, his father number 2 and his mother number 3. The number of a father is always twice that of his son and the mother is one number higher. Thus, number 40 is the father of number 20 and 41 is the mother of number 20. From among the icons in the popup menu you can also choose a graphical display of the ancestor report. Next page: Genealogy relationship calculator.